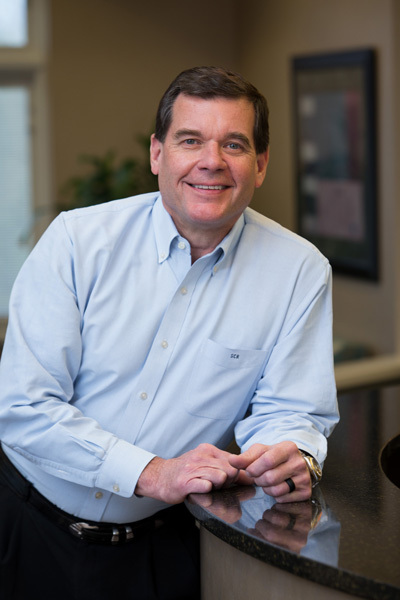 Dr. Roehm has practiced orthodontics in Peoria, Illinois since graduating from Saint Louis University in 1979 and holds professional licensure in Illinois and Missouri. While private practice is where he has spent the majority of his career, he has had the opportunity and privilege to be involved in academia as well. He was an Assistant Clinical Professor at Saint Louis University Center for Advanced Dental Education from 2001 to 2016. His area of special interest has been temporomandibular dysfunction. He lectured on functional occlusion and taught splint therapy to all resident classes and followed patients in the clinic and lectured on orthodontic systems and practice management. In addition to his time spent with the residents at St. Louis University, he was also an adjunct professor at St. Francis Medical Center General Practice Residency Program in Peoria, IL. He has been married to his wife Kathy for 43 years and they reside in Dunlap, Illinois. They have four adult/married children and twelve grandchildren. He was joined in practice by his daughter, Melissa Roehm Stigall, in 2006. He feels blessed to have had the opportunity to practice orthodontics, a profession he truly love. Charles H. Tweed International Foundation for Orthodontic Research – Tuscon, AZ: Completed Course Work: 1983. Instructor status: 1987, 1989, 1991, 1993, 1995, 1998, 2001, 2003, 2006, 2009, 2011, 2013, 2014, 2017. Edward H. Angle Society of Orthodontists, Angle Midwext Component - Granted general membership status January 2006. Roth/Williams Program in Functional Occlusion and Orthodontics – Burlingame, CA: Two year, seven week program completed in 1999. American Board of Orthodontics: Achieved Diplomat Status by Examination (1988), St. Louis, Missouri. American Association of Orthodontists Annual Session, San Diego, California. April 22, 2017. The Art of Torqueing; Not Twerking. Edward H. Angle Society of Orthodontists, Angle Midwest Component: Annual meeting Naples, Florida. January 26, 2015. Idiopathic Condylar Resorption. Charles H. Tweed International Foundation for Orthodontic Research and Education, Thirtieth Biennial Meeting, October 23-25, 2014. Interceptive Growth Modification. Charles H. Tweed International Foundation for Orthodontic Research and Education, Thirtieth Biennial Meeting, October 23-25, 2014. Condylar Resorption: A Literature Review. American Association of Orthodontists, Annual meeting Philadelphia, Pennsylvania May, 2013. Stability of Orthodontic Treatments; Does it Really Matter Where We Place Teeth? Edward H. Angle Society of Orthodontists, Angle Midwest Component: Annual meeting Naples, Florida. January 30, 2005. American Board of Orthodontics, Board Certification Examiner February 2009, February 2011 Dallas, Texas; June and November 2012 Dallas, Texas; February 2013, February 2014, St. Louis Missouri, February 2015, St. Louis Missouri. St. Francis Medical Center Peoria, Illinois; Staff Privileges: 2009 - 2016, Department of Surgery. University of Iowa, College of Dentistry, Department of Graduate Orthodontics: Iowa City, Iowa. Assistant Clinical Professor, 1989-1991. Edward H. Angle Society of Orthodontists, Regular member of Angle Midwest Component 2006. His Helping Hands Ministry Inc: Project Coordinator 2008- Present, Wheelchair Ramp Construction and Home Repair for under-privileged.